You must indicate so in the section here. Please remember that in addition, even though we will try to accommodate each request, we can only guarantee your ring size. The colour will be decided by us based on highly fluctuating stock and filming schedule. 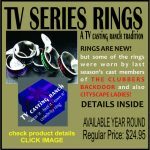 WANNA FEEL LIKE A CELEBRITY – Get your hands on a VERY LIMITED number of these rings that were worn by some members of the cast of either THE CLUBBERS BACKDOOR or CITYSCAPE LADIES! during their TV set adventures. NOTE: Most of the rings are brand new HOWEVER IF YOU WANT TO RECEIVE A RING THAT WAS WORN BY A CAST MEMBER OF ONE OF OUR SERIES, please tell us during the check out process in the COMMENT BOX!